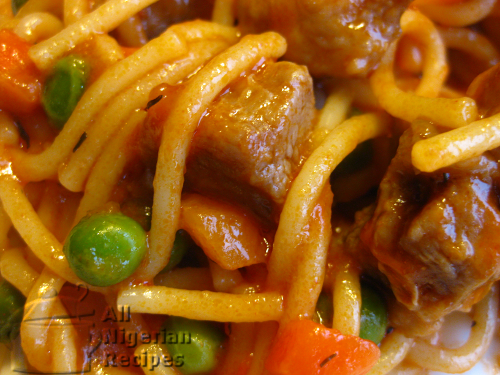 Raise your hand if you think that cooking spaghetti and eating it with the good old beef/chicken stew is oh-so-boring. I think so too. That's why I bring to you the Spaghetti Surprise recipe. This recipe is prepared with the ingredients you see in Nigerian markets and in food stores all over the world. There's even a bag of frozen vegetables (shown in the video) that I use to prepare this recipe in no time. So there is no reason why you should not prepare this recipe today, right now. Go ahead, give it a try and you will be deliciously surprised. How did I come up with the name Spaghetti Surprise? It's a long story, but to cut it short: One day, I was out of most food ingredients and I was wondering what to cook. I brought out all the fresh ingredients in my fridge and thought I would make something with Spaghetti. Hubby asked me what I finally decided to cook and I said, "I'm not sure, some concoction of sorts but I assure you, it's edible". He said, "Oh, it's a surprise then". Note: You can prepare this meal with minced beef instead of beef cuts. In that case, fry the minced beef like we do for the minced beef for Nigerian Meat Pie filling till pale, then adding the stew in step 3 under cooking directions below. 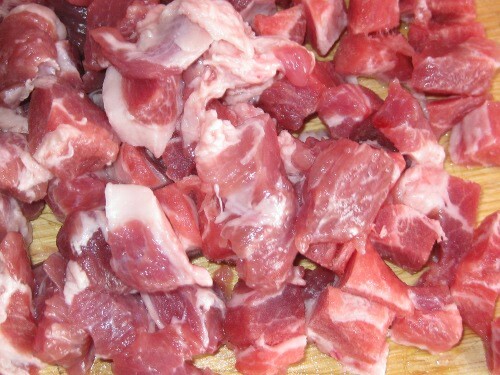 Cut the beef into small pieces. It is best to buy the part of beef that has streaks of fat in it. This greatly improves the taste of this recipe. Wash and cut the cabbage, green pepper and green beans into small pieces. Also wash, scrape and cut the carrots into tiny pieces. Cut the onions into small pieces and remove the green peas from the pods. If you will use tinned green peas, simply drain the preservation water and rinse with some fresh water. Cook the beef with the onions, thyme and stock cubes (Maggi or Knorr). While the meat is cooking, start cooking the spaghetti in a generous amount of water. When the beef is done, add the Tomato Stew. Add the vegetables, salt and pepper to taste and cook for about 5 minutes. When the spaghetti is done to your personal preference, drain the water and pour the mixture of beef stock and tomato stew you prepared earlier into the pot of spaghetti. Stir well, cover and leave to stand for about 5 minutes. The Spaghetti Surprise is ready to be served. The Spaghetti Surprise is perfect when eaten alone but feel free to serve it with Fried Plantain.